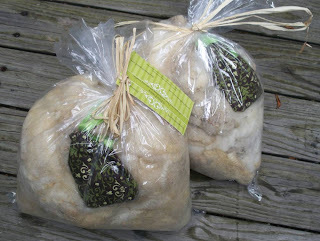 I just bought these two prettily packaged bags of unwashed fiber from A Fine Fleece. Just in time I might add because at the moment their Etsy shop is closed for vacation. It's always strange when I am in "going back to work" mode in August when the rest of world is closing up shop. No one wants to hear us teachers whine about being short changed in the days off department, but it does play with your psyche to be so out of sync. Walk into to Walmart and look at all the.....(it hurts me to type this)....BACK TO SCHOOL stuff everywhere. I dare you not to get the heebie jeebies. It is ingrained in all of us to dread the return to the classroom and teachers are no different. 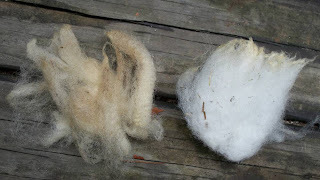 I should be home for many, many more weeks so I can play with the likes of this pretty stuff ( 4 oz each of Texel and Corriedale, I believe) and not be locked in an over air conditioned room putting up bulletin boards and writing names on little paper apples. August 17th. That is the dreaded date when I will be back to sitting in endless boring meetings without even being able to knit. Where did this summer go? Thanks to having to wait out The Mister's knee MRI's at 8 am, I got a lot of miles on the Tour de Fleece socks. Hospital knitting is the best kind because there is always so much going on that it keeps the mind pleasantly occupied as the fingers are flying. Today I got to overhear conversations about everything from Tony Romo (does he really have a Keep Out Jessica sign on his house? Really?) to who was responsible for leaving the mess in ICU room 6 (someone was in BIG trouble). I even got to discuss the differences between crochet and knitting with an interested stranger who marveled at my ability to knit 2 socks at once. Magic Loop always gets lots of attention in public. I did wonder, however what she thought about the weird looking yarn I was using. It certainly isn't Vanna's Choice but I am growing very fond of it. 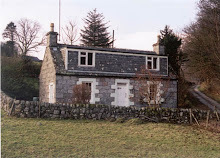 Number Two Son telephoned me last night to chat and in the course of the conversation we got around to discussing the contents of my blog. He is a very loyal reader and I take his criticisms to heart. He described my blog as like reading a play without an ending. Lots of stuff happening but it seems I am going nowhere. True to a point, but in my defense I present the evidence that there has been a few conclusions lately. Exhibit #1: The Surf Scarf. This summer I made 3. Exhibit #2: The Rustic Socks. Handspun from raw wool processed by me. 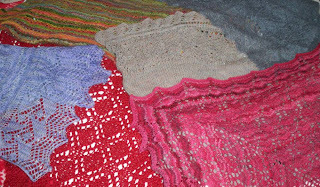 Exhibits #3&4: The Palette Cardi and CPH. 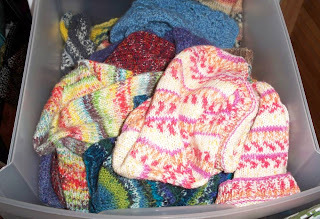 If I don't slow this knitting thing down I will soon have to go rent a storage facility. Moth proof, of course. 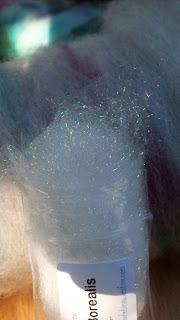 There is no way I can capture the spectacular sparkle that comes off these Angelina Fibers. 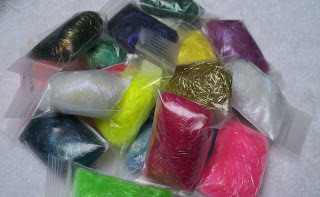 I bought a batt recently that was loaded with these threads of pure shine and that made me go looking for their source. I found a few Etsy vendors that sell it by the package but over on Ebay I found someone that sells large samplers of all the colors. Since decision making is not my thing I bought the classic color sampler. My poor brain is working overtime planning all the ways I can add them to the batts I plan on making with all that glorious Phat Fiber Fluff. A little bit goes a very long way so don't be fooled by the small packs. There is enough here to last a very long time. I know I have to have my head examined for this but I just had to have a genuine George Tabachek Russian spindle in order to further frustrate and confuse myself in those increasingly rare moments I have all to myself. After watching a demo on Spindlicity I went on a mad hunt for one that took me pretty much nowhere for a long time. 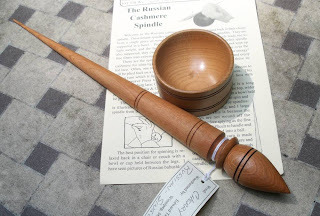 If you Google "russian spindle" you quickly find The Wheel Thing where you can find oodles and oodles of them-that are already sold. Newbie spinner that I am, I thought that I did not really need one of this quality but the selection out there in internet land is slim to none. So back to these beauties I went. I studied the available ones very carefully until one stood out among the others. Meet R8 Cherry and her cute little spinning cup which is purchased separately. I get a big kick out of going to the website and seeing her picture with the words SOLD on it. The website is very upfront about us newbies needing all the help we can get so for an extra $3 you can get a nifty little guide that shows how fun it will be to learn to spin with my new little friend. 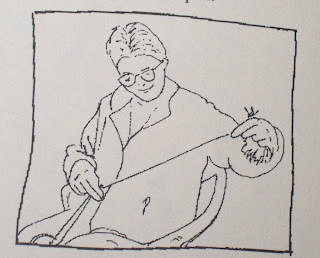 Here is one of the illustrations from the guide. See the spinning lady is smiling. That's all the assurance I need to give it a try. And even if Russian Spindles are not your thing take a look at this site anyway. I have never seen so much great spinning stuff in one place. Remind you if anyone you know? 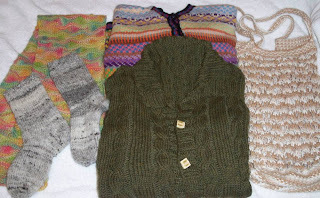 This is what I ordered and what I won for being the 100th customer over at the Moonwood Farm Etsy shop. I had ordered some small samples of the carbonised bamboo and low and behold I am now the proud owner of 4 more ounces of it! Thank you.Thank You. Thank you! I love it. It's the most wonderful stuff. 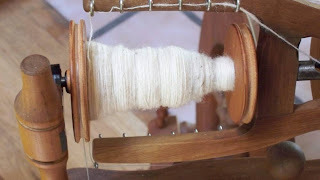 If I can figure out how to spin it, I have visions of turning it into something light and airy using a pattern from Victorian Lace Today and using my new Russian Spindle that I am waiting anxiously for. More on that adventure to come. Oui. That's moi in the polka dot dress standing next to the guy in the freaky spotted jersey. Just kidding. 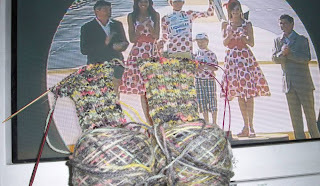 But that photo clearly explains why my Tour de Fleece socks turned out looking like this. After 3 weeks of looking at people dressed like that-what else could I expect? The French. You gotta lov'em! 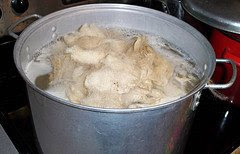 I learned a lot about fiber prep during this year's Tour de Fleece. 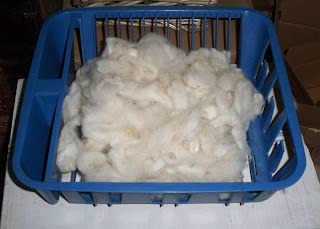 I went from making lumpy bumpy batts to ones so white and fluffy I wanted to take a nap in them. 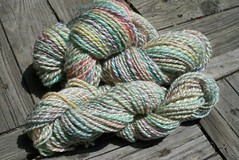 I used them to produce two big skeins of fairly decent sport weight destined for some scratchy socks. All was well until I started the dyeing process. While I was spinning and watching the Tour, I thought it would be a good idea to dye the yarn using the color of each leader's jersey. 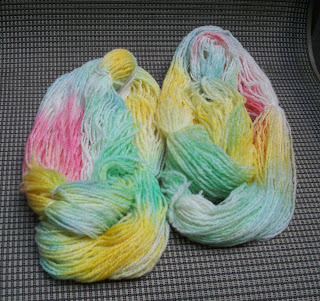 Using food coloring I came up with these candy colored skeins that looked more like layette material than sock yarn. I got out my black Jaquard dye and tried to add some stripes. As soon as I put it on I realized I had made a BIG MISTAKE. 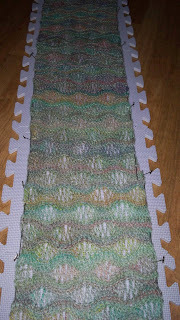 Instead of staying in neat little spots it started to run through the entire skein taking over all the other colors. Here is the sad result of 3 weeks of hard work. It hurts my eyes to even look at it. I still have a giant box of the unwashed fleece that I spun this from so today I'm going all the way back to the starting line. Versus usually reruns the Tour over and over so I am going to keep watching and spinning until I get it right. 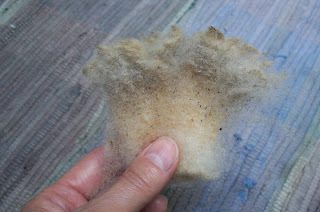 Here are a few close ups of the spectacular things that were in my July Fluff Box. Everything is so soft and squishy. You want to rub it on your face. When was the last time you did that with wool? This silk hankie got a lot of attention from the family. They thought it was a real hankie. No nose blowing here please! Two hat patterns I really, really liked from the video. And something I have wanted/needed for a very long time. 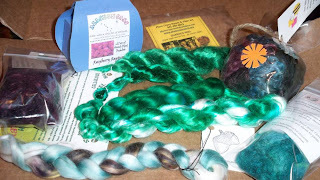 My Phat Fiber Fluff July Box is here! It is stuffed with the most amazing stuff. It's like going to a fiber festival right in your own living room. 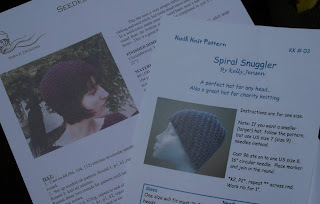 I would never have known that all this wonderful stuff existed if I had not discovered the Phat Fiber Phrenzy over on Ravelry. 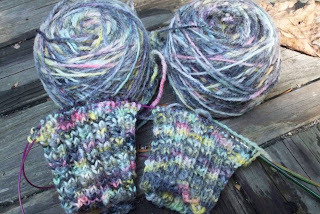 The July theme was non-sheepy fiber. 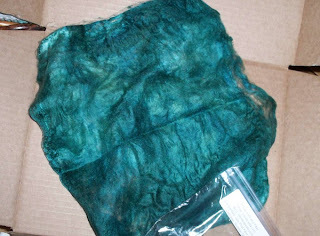 I have a gorgeous green silk hanky, a giant batt of a bamboo, silk and angora mix, and lots of soy and milk fiber samples. It is all so soft and silky with colors that are so clear and bright. I have my work cut out for me now. I have got to figure out how to do justice to it all. One of the best things in the boxes is the bag of tiny goodies. 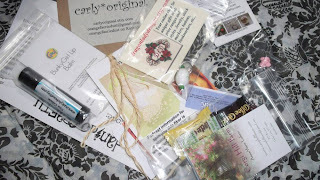 Stitch markers, lip gloss, tons of coupons and even some candy. I am always overwhelmed by the generosity of all the vendors. 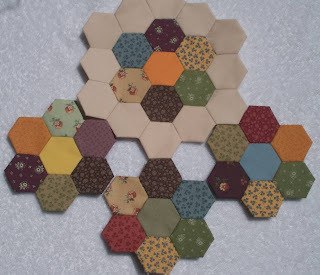 This is the beginning of my Hex Quilt. 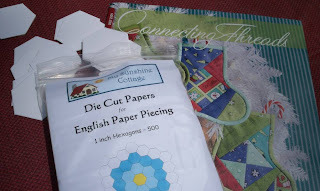 The paper pieces come from My Sunshine Cottage and all the material and thread come from Connecting Threads. I bought most of the colors in the Country Essentials line of Spring plus a few others that were on clearance. Be advised that if you run out and buy some of those little papers for piecing you will quickly become addicted. I carry them wherever I go. In the same bag as my sock knitting. 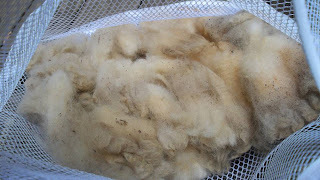 Here is the photo I forgot to take of the clean fleece. There is still a bit of vm which seems to shake out easily and yellow tips that in my experience disappear during the combing process. I love this before and after shot. Makes me want to go wash some more. 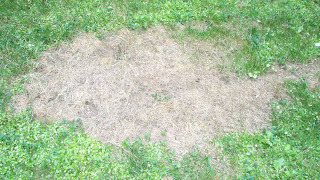 Much to The Mister's dismay my last attempt at washing a fleece resulted in this big dead patch of ground in the front yard. Don't ask me why I thought is was a good idea to drain a giant pot of filthy, near boiling water right outside the front door. Nothing will grow there. If you have some weeds to kill this might be something to try. 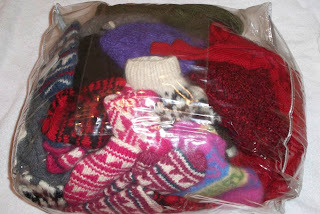 Then I need to separate them from the rest of the matted old stuff and lay them out in a mesh bag. 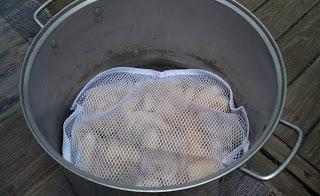 Now I can soak the hell out of them in my old crab pot. I live in Maryland where everyone has a giant crab pot along with a giant container of Old Bay whether we actually cook crabs or not. The best part of it all is that instead of dealing with the enormous pot of fuzzy spaghetti I had been trying to drain, I can now just slide the whole bag into the sink. For the sake of keeping the locks intact, I had wanted to try to keep the stuff flat but the instant I picked up one side of the bag they all rolled together. It didn't seem to be a problem. At the moment the whole mess is drying in the sun. 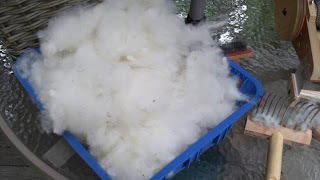 I forgot to take a picture of it so you will have to take my word for the fact that I have a lovely mound of creamy white fiber almost ready for combing. Front Bands and Buttons Oh My! 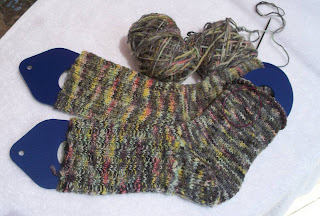 I hate, hate, hate, hate picking up and knitting on the front bands of sweaters. I NEVER EVER get them right on the first few tries. I have to redo them over and over to get them to either not pucker up or flare out. I am on try number 3 here with the CPH and I think we have a keeper. I am even starting to believe that putting the buttons on may be a possibility in the near future. I picked these up at the MD Sheep and Wool Fest from Jennie the Potter. The verdict is still out if they are going to work for this particular sweater. I love the buttons but they may work better on a lighter garment. That is the inside front of the sweater that the buttons are laying on by the way. That is why my cables look rather wonky-they are inside out. You think I would have noticed that before I took the photo. 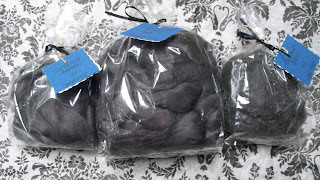 It is very fitting that I am posting the last of the Phat Fiber Fluff Box purchases arrival on the very day that I managed to purchase ANOTHER fluff box! It was a total last minute impulse. 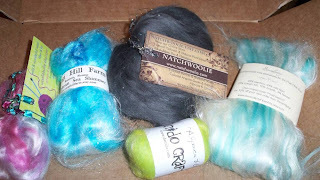 I had planned on sitting out this month as I am really not interested in starting a relationship with non-sheepy fiber when I presently have a house packed with sheepy goodness. 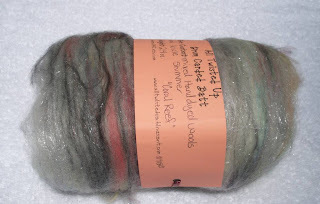 Then for some dumb reason I watched the July preview video on the Phat Fiber website and I was hooked. All that silky fiber in those incredible colors called to me all night. It invaded my dreams and at 5:30 Eastern Time I was up and ready to start refreshing and scrolling my brains out. At exactly 10:01 I was the proud owner of another box that comes with my personal promise to purchase from at least 3 of the contributing vendors. I certainly did not have a problem with my last box. I couldn't seem to stop buying stuff. The lesson learned however, was to order quickly or else like the sample boxes themselves, the good stuff is gone in a flash. This adorable little glitzy batt from All Twisted Up was the ONLY sample that I could actually purchase from my first box. Happily it was my number one choice. I loved the subtle colors with the touch of sparkle. Looking at their Etsy site is very dangerous for my bank account. I want it all. While the grandkitties were here, my latest weaving project had to be put away due to the temptation to bounce on it by the little critters. After catching them using it like a see saw, away it went. Out of sight, out of mind and even worse, I found the red wrap I have been searching for ever since I saw Meryl Streep swing hers around on top of that cliff in the wedding scene in Mama Mia. $8 at Marshalls. Do I really need two red wraps? Now if I could only find that dress she was wearing. I have a ton of this stuff. Some still needing a scouring, some in different states of fluff. I was up until 2 am researching the different pickers that are on the market and trying to convince myself I need one. 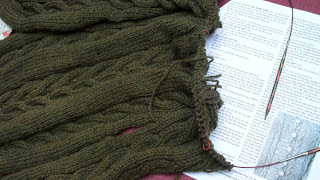 After scanning all the Ravelry forums, weighing the pros and cons to owning one became only more complicated. I am tempted by this little box version found on Etsy but do I really need ANOTHER expensive piece of wool processing equipment? Numbers two and three of the Phat Fiber Fluff Box purchases arrived on the same day. First I opened this beautiful braid of Wensleydale in the Flame colorway from Beesybee Fibers. 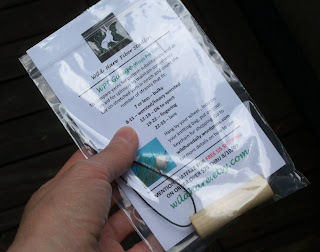 It was beautifully packed with a small bag of lavender to ward off any unwanted visitors. 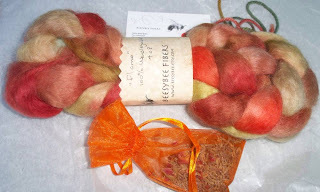 Next I opened "Bag O' Roving" from Poppy Flower Fibers. It's a bag of small samples that will provide hours of fun for me and Mr. 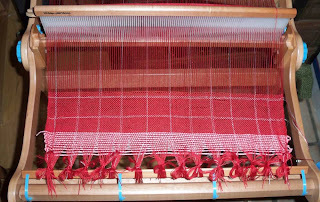 Drum Carder. 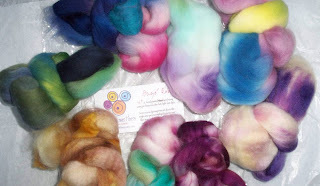 I am starting to think that it was an unfortunate decision to start spinning some large projects at the same time that all these lovely small temptations have shown up. 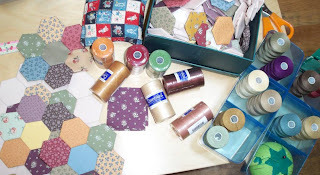 I suppose I could buy more bobbins. It is going on week two of The Mister's vacation and he is seriously starting to make me CRAZY. Everyday it's the same: get in the car and go somewhere as soon as possible. Add that to The Daughter's recent medical woes and I am WORN OUT. Brain on overload. I am taking advantage of this brief moment while he is taking his morning ride to the hardware/grocery store ALONE to lay out some of my projects hoping to entice my poor brain to seek comfort in the finishing of certain UFO's that should be calling my name but sadly are not. Case in point, my beautiful little CPH that is NOT getting it's hood. I'm going with the collar variation due to the lack of desire to look like an elf. Family stop giggling. I know that you know that looking like an elf (or a hobbit for that matter) is ordinarily not something I try to avoid, but the idea of wrestling with a hood that I will never use is looking pretty good right now while I am struggling with a bad case of the summertime blues. 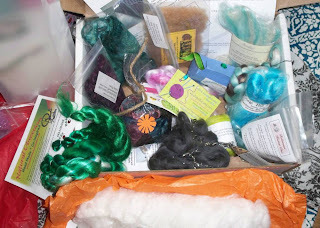 I promised the yarn gods that if I won a June Phat Fiber Fluff Box that I would order fiber from at least 3 of the vendors that supplied samples to my box. This is the first of 4 to arrive. In only one case could I actually purchase more of the fiber that I received. That was not an issue because everyone's Etsy shop still had lots to choose from. Fiber Fancy was the first to get the goods here. They had so much gorgeous stuff that I spent a good half hour trying to decide. 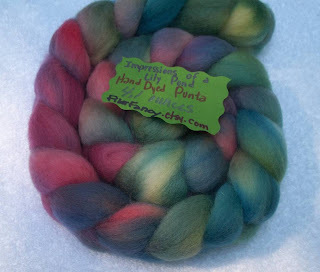 I went with some Punta in this beautiful colorway because I had never seen it before. It feels lovely. The absolute best part is that I've still got 3 more arrivals to look forward to. I just love getting packages. 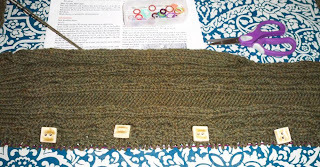 I put in the last rows this morning while accompanying Daughter to a doctor's appointment. It's pastel, and it's long but the colors ended up doing some weird business as hand dyed yarn tends to do. No matter. It's done. I'm done. Now I can get on with other things. 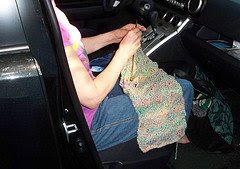 The Mister is on vacation this week so I am spending lots of quality knitting time in the car. I am not on my way to any exotic location or luxury resort. The surf scarf has grown considerably during our many trips to....Walmart. I am especially appreciative to the checker who forgot to put the shampoo and body wash in the cart causing us to have to drive back again (a whopping one hour round trip) to pick it up. Today Home Depot is on the agenda. This baby will be done by the end of the week. If insanity is repeating the same thing hoping to get different results than I am completely insane. 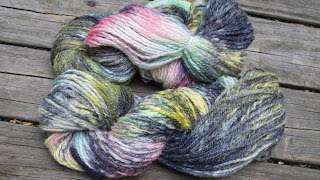 I keep dyeing and spinning the wool for this pattern over and over hoping to be able to make one that meets with Daughter's COMPLETE approval. She kinda liked the green one, hated the neon one and hopefully will LOVE this one since she was actually here for a visit when the yarn was plied. I even made her wind it into a ball with my nifty new ball winder hoping she would bond with the yarn before I wasted any more time knitting another reject. I've got my fingers crossed, toes crossed and eyes crossed that this will be the LAST Surf Scarf EVER coming off my needles. I am not officially signed up to spin with any particular team. I learned my lesson last year with the Ravelympics. Turning your hobby into a competitive event is just not my thing. Summer vacation is when I am try to wean myself off the Malox and Zantac. I sure don't need another thing to fret about. I still have plenty, thank you very much. Having said all that, I AM going to set a personal goal to spin from those newly made wool batts each day of the Tour in order to get this bobbin full by the time the peloton arrives on the Champs Elyees July 26th. Vive la France! 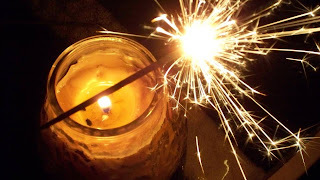 Still life with citronella candle and sparkler. 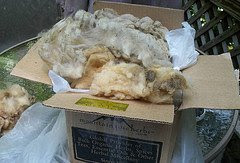 I bought this filthy box of wool from a seller on ebay a while ago. I forgot to save the information that tells me what kind of wool it is. Duh. Taking advantage of a nice day, I decided to give a bit of it a good scouring. 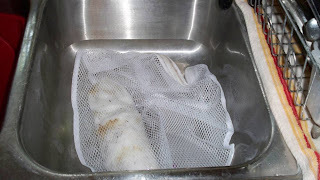 After 3 washings it was still pretty yucky. 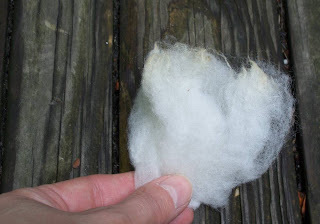 After a drying in the sun and a good picking over it turned into a giant mound of snowy white fluff. 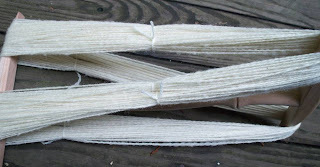 I am having a good old time turning it into pretty little white batts on the new drum carder. It's spinning up into a very fine yarn but, I really have to figure out how to avoid ending up with so many little lumps. I have done some research but it is all in a foreign language to me. I need You Tube. 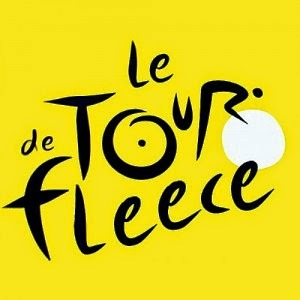 I hope there is someone demonstrating how to clean a fleece the RIGHT way.